Second release from 12-3 Recordings is officially out! Two house tracks with two rather different characters, deep and heavy from Sticky Stockholm! Give me is a continuous house beat, with the heavy, classic marimba melody and a tight conga groove over a classic bass-and-kick-combo, made strictly for the dance floor: providing that driven, steady pumping beat. 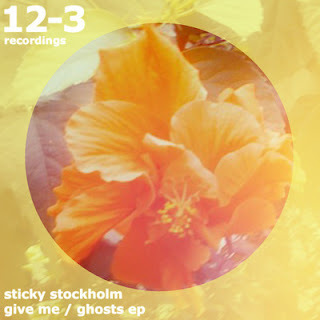 Ghosts goes a in another direction, a hollow yet sharp feeling and several dimensions of percussion defines the track, while ghostly cut up voices adds the details. When the bassline kicks off, the track turns massive and pounding, a good b-side to this EP.